Is any symptom from below troubling you? This could be result of mega-6 and omega-3 fatty acids misbalance in your diet. Typically, foods that contain or are prepared with vegetable oils are rich in omega-6 fatty acids while the primary dietary source of omega-3 fatty acids is fatty fish. A healthy diet should include a balance of omega-6 and omega-3 fatty acids. Regrettably, many Western diets include too many fried, fatty foods that contain unhealthy levels of omega-6 fatty acids. Furthermore, many diets do not include the frequent consumption of fish leading to an unhealthy fatty acid ratio grossly in favor of omega-6 fatty acids—as high as 30:1 by some estimates. Increasing dietary intake of omega-3 fatty acids while reducing omega-6 intake will help restore a healthy fatty acid ratio. Pharmanex’s MarineOmega is a convenient and safe way to increase dietary intake of omega-3 fatty acids. The ultra pure fish oil in MarineOmega is extracted from fish harvested from pristine marine waters. MarineOmega is manufactured to the high standards of the Pharmanex® 6S Quality Process guaranteeing that each bottle is free of harmful toxins, contaminants, and heavy metals. 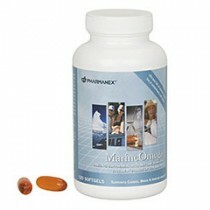 MarineOmega also contains vitamin E to preserve product freshness by preventing oxidation. MarineOmega also contains an important scientific discovery— krill oil. Krill is a small ocean-going crustacean that contains a high concentration of EPA and DHA in a unique phospholipid form that passes through the harsh digestive system with DHA intact. This unique krill source passes though the brain-bloodbarrier with ease, making it a logically beneficial and bioavailable source not found in other fish oil products. Krill oil also contains the antioxidant carotenoid astaxanthin and a unique flavonoid—the first flavonoid to be extracted from a non-plant or algae source that provides additional antioxidant benefits. MarineOmega is the first omega-3 product to contain the benefits of krill oil. MarineOmega is conveniently formulated to provide an optimal level of 1200 mg/day of ultra-pure omega-3 fatty acids with krill oil rich in EPA and DHA in four vanilla-infused gel apsules. It also includes lemon oil for a pleasant aroma and minimal fishy flavor. Used together, MarineOmega and LifePak® constitute the most comprehensive anti-aging supplement program available providing optimal levels of essential micro and macronutrients necessary for longevity and wellness, but typically lacking in most diets.